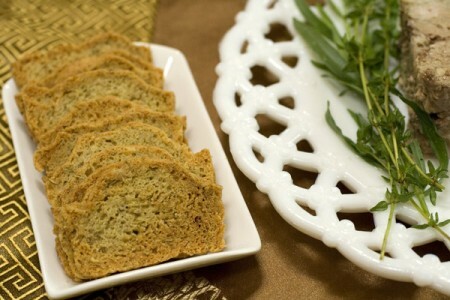 For the bread, due to gluten free needs for my hubbie I developed a recipe that was good as bread, but even better as crackers when they were twice baked like biscotti. They came out so good that I also developed a wheat based version from another recipe, and frankly I can’t stop eating them. The crispy initial bite is followed by the mellow taste of wheat and a hint of rosemary. So, both recipes are here for you following this post. 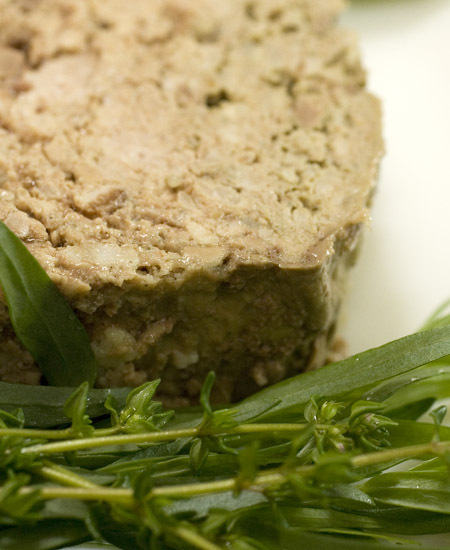 This made a lot of pâté, so now I am trying an experiment – how does pâté freeze? I developed this recipe starting with the concept in a recipe in a cookbook called Grazing by Julie Van Rosendaal to go with a Daring Cooks pate challenge. It is very good as a quick bread right out of the oven, but also wonderful as a cracker or crisp if thinly sliced and baked again to dry. They are sort of like Raincoast Crisps, a popular but very expensive west coast cracker sold in Canada. Combine dry ingredients. The total flour is 1 cup, so you can try other combinations. Whisk the ingredients to distribute all the stuff. Add wet ingredients and mix a stiff batter. Put in oiled small loaf pans then wet your gingers and push the sides of the batter down so the center is mounded up like a loaf. Bake at 350, the time depends on the size of your pan, mine were very small load pans and they took about 15 – 20 minutes. If making crisps, allow to cool, in fact even put the loaves in the freezer for a little while. Then slice into 1/8 inch pieces and arrange on ungreased cookie sheet. Bake at 300 for about 12 minutes, then turn opver and bake again until crisp, about 12 minutes more. Watch carefully towards the end because they go from crisp to overdone quickly. Try spicing this with other spices like herbes de province, cumin and coriander, etc. The cheese can also be left out. I lov e a Canadian Cracker called Raincoast Crisps, but they are really expensive and sometimes hard to find here. Julie Rosandaal, in her cookbook Grazing, has a recipe that is close to the bought versions, and I have made it several times with lots of creative tweaks. This time I tried to develop a savory rendition of crisps. They were so good as bread that I ate half a small loaf right out of the oven. They are equally good dried as crisps. And another great thing, there is no butter or eggs in this recipe, but because of the buttermilk they are moist and rich as a bread, and crisp as a cracker. Mix together and blend thoroughly. Bake at 350 in small loaf pans until the tops are cracked and slightly browned. Allow to cool. Eat fresh like this, or cool, even freeze for a little while, then slice very thin. Bake at 300 on a cookie sheet for 15 minutes, then turn over and bake again for 15 minutes. Watch like a hawk at the end because they overcook easily. 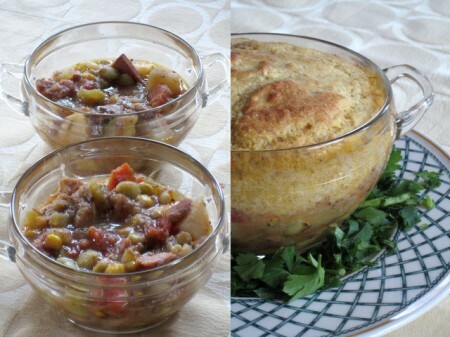 I have seen recipes for Brunswick stew in some of my more traditional cookbooks but had never been inspired to make it. So, this is often where Daring Cooks and Bakers is good for pushing your envelope a bit. The stew is basically a mixture of meats, including chicken and ham, with vegetables similar to succotash. I made the shorter recipe that was in the challenge. The stew is a tasty meat and potatoes stew. The spicing is poultry seasoning. It was fortuitous that I had just made a large roast ham o the weekend, so the rest of the stew was easy to prepare. When I finished the stew that night it was good, but not really awesome. So the next night I decided that a gluten free cornmeal topping would jazz it up a little, and it did. My version of a gluten free cornmeal batter was placed on warmed bowls of stew, then baked for about a half hour. The cornmeal soaked up some of the liquid, and made a very tasty top to the stew. My hubbie liked it, but said it was not on his definite make again list, and I feel the same. Anyway, it was a fun challenge and I thank wolf for the challenge. Gluten Free Cornmeal Recipe follows here. Sorry there is a problem with permission on my site tonight, so I will add the pictures tomorrow. I use this basic recipe for cornbread but often cut back the cornmeal to about a cup and add other strong gluten free flours. If I want a strong corn taste, I use the full 1 ½ cups cornmeal. Use real buttermilk, it really makes a better product, ignore the advice that vinegar and milk works the same, it doesn’t. This is a very dependable gluten free recipe for me. 1/4 cup butter, cut in like biscuits Cut butter into small pieces and cut into the batter like in a piecrust. You can use ¼ melted butter or oil, but I like the texture better done like the piecrust method. 1 ½ cup buttermilk (use the real stuff!) Add eggs and buttermilk. The batter will be fairly runny but thickens up quickly. Bake at 350 until done, the time depends on the size of your pans. I also make this into muffins. 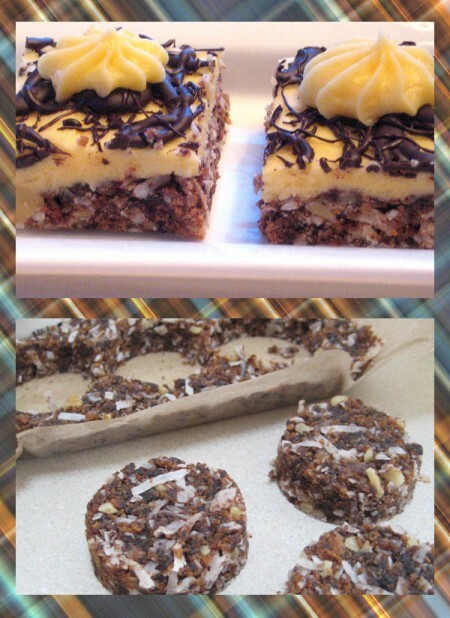 My family never baked anything called “Nanimo Bars”, but my mother did make something that was really similar called Chocolate Coconut Squares. ( I prefer my mother’s version and I’ll explain why in the next paragraph, followed by her recipe.) She only made them at Christmas, and we loved them and looked forward every year to a batch of these little lovlies being in her secret stash that she hid from us six hungry children until company came. When I was working on this challenge, I called Mum in PEI and asked her where the recipe had come from. We also lived in the US when I was young, but mum said the recipe had come from her mother she thinks. She was sure it was not one of her American recipes because she recalls she had to bring Bird’s Custard Powder from Canada to make these when we lived in Chicago and Detroit. How is my mother’s recipe different? It has a little less sugar, more graham crackers, no butter in the custard, and unsweetened chocolate on top. I like them better; they are a little less rich and not quite as sweet. The part I especially liked in the squares was that she drizzled unsweetened chocolate on the top, and the contrast of bitter chocolate and sweet custard was sublime. Because there is no butter in the custard it does not behave like icing, so I couldn’t have made the decorations as well. These are so decadent that let’s face it they are not health food, so I will make the butter version custard again if I am crazy enough to do these decorations again. Here is the recipe, and I asked my mother’s permission to post it. Mix all together with a whisk or mixer. The original recipe has no milk quantity. 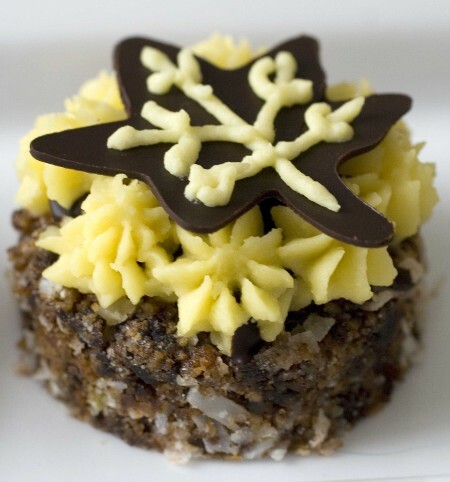 If you want to decorate and make these really rich, then add 1/2 cup butter like the daring bakers recipe. 1 square melted unsweetened chocolate (1 oz) Melt chocolate in double boiler, then drizzle on the cold squares in a swirly pattern. Depending on taste, you may want to add another square of chocolate. Refrigerate the squares overnight if possible, then remove from pan and cut into squares with a sharp knife. You can also “deconstruct” these and cut the squares with a circle cutter (this sounds like an oxymoron doesn’t it! ), and add chocolate cut outs. Here are a few more pics of the process. I spread the chocolate mixed with a little butter, let it harden, then cut out with little leaf cookie cutter. The top is a variation of the regular square. The bottom shows the circles in progress. We had a small dinner party at the end of the holidays and I needed a little something for dessert. 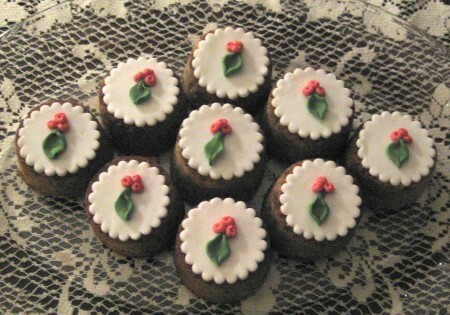 I also had the decorating urge, and some fondant from Golda’s Kitchen ( http://www.goldaskitchen.com/ ) that I wanted to try. Although you can easily make fondant, it is a lot quicker to just open the container, peel back the plastic, and start decorating. If you haven’t used fondant before, it is really easy, tastes reasonably good, and can produce smooth sheets that are a joy to decorate with if you don’t feel like dragging out the piping bags and making a mess. Since I had other things to fuss with for the dinner, the fondant solution was perfect. I used a scalloped circle cutter for the base, then rolled balls of coloured fondant to make the leaves and holly berries. A toothpick indentation in the berries gave a touch of reality, and these were done toute suite. The cake is my favoutite cake when I am just craving something good but simple, and not too sweet. 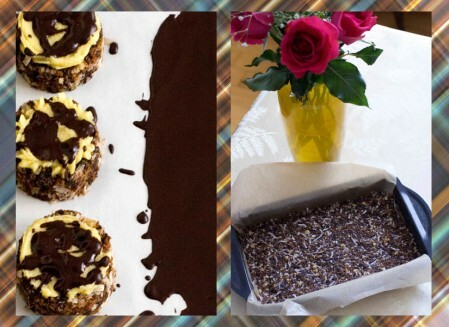 This recipe is adapted from A Passion for Desserts by Emily Luchetti, a great dessert cookbook. Make sure you use buttermilk and unsalted butter for the best taste. This cake keeps very well frozen and is a great thing to have ready in the freezer when you need a quick little shortcake or ice cream accompaniment. I love this cake. I have made a gluten free version of this cake and it is also very good, but needs a lot of tweaking, so I will post it when I test the recipe again as quite frankly I dont remember exactly what I did. 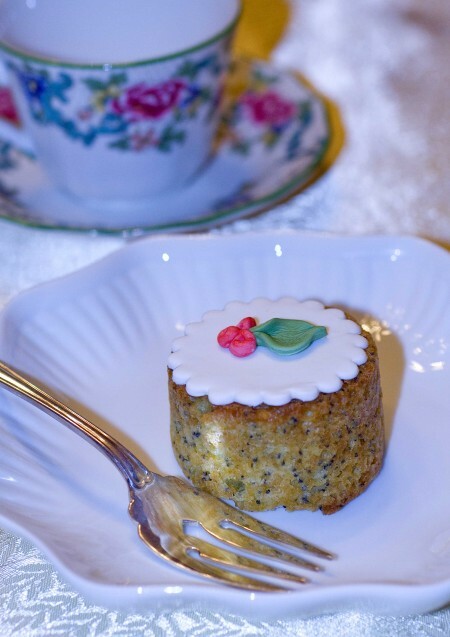 TRhis cake is also excellent as a short cake or as a white cake with swiss buttercream frosting. 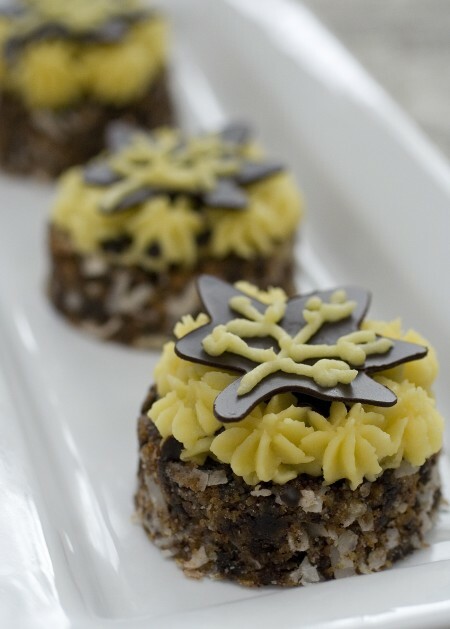 This recipe is adapted from a recipe in A Passion for Desserts by Emily Luchetti. Preheat oven to 350 degrees. Spray grease or butter pans. Mix dry ingredients and set aside in a separate bowl. 1 tsp vanilla extract Cream butter until light. Add in the sugar and beat again, then add the eggs. Add buttermilk and wet ingredients in 2 batches. Bake in muffin or small cake pans. Time – it depends on the pan, usually about 15 to 20 minutes, but keep watch on them. They are done when the edges are slightly brown and the middle has risen and often has a center crack. If using a layer pan this recipe makes one 9 inch layer. This cake keeps very well, but the crust can get a little soggy, so I like to freeze whatever isn’t going to be eaten within a day. 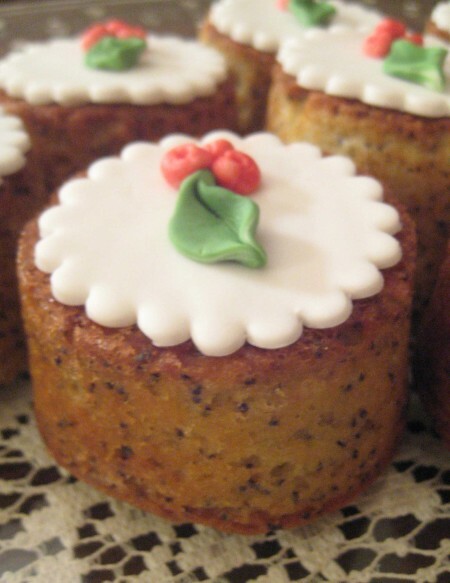 The frozen cakes keep very well, and are a great way to have a small cake with a bowl of ice cream. Two of the cookbooks I have drooled over several times are Pastry by Michel Roux, and Sweet and Savory Tarts by Eric Kayser. I finally broke down and bought the Michel Roux book. I have another cookbook by Michel Roux (Michel Roux’s Finest Desserts), and it is very informative, in fact it can be used like a self taught course. I love finding special purpose baking pans, and had a long rectangular tart pan, inspired by a picture in the Eric Kayer book, in my baking cupboard that I had never used. I decided to try a Michel Roux pastry recipe and also to do a gluten free version for Greg. 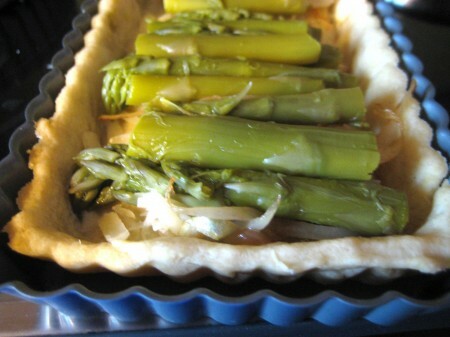 For the dough I used Michel’s tart pie dough, which he says is known as pâte a foncer (p. 23). It has egg and a little sugar in it. The dough works up beautifully and is very easy to work with after a short rest in the fridge. For the gluten free version I used the same recipe, but my gluten free flour mix and fresh ground buckwheat flour. I am finding that buckwheat flour behaves well, and has good binding qualities so not as much xanthum gum is needed. I will post the gluten free version after I make it one more time to test the recipe as I was just throwing in flour and had not measured very carefully. In the taste department, the gluten free version worked out very well, and Greg was pleased that it was not so strong that chewing it felt like exercise like some of my other gluten free pastry attempts. 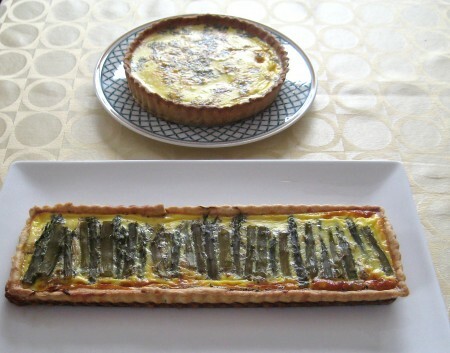 My French amie Martine makes very nice tarts, and what I have learned in watching her is that she puts a lot of vegetables in an artistic arrangement on the bottom, then fills it with the egg mixture. She uses less liquid mix that what I have usually used, and sometimes some cheese such as chèvre. In a sense, the egg is really just the binder that holds everything together rather than the main attraction. I decided that Matine’s method is what I would try, so I cooked up some somewhat sad asparagus that had been forgotten during the holidays, and also caramelized some sweet onions. The rectangular tart took a lot of pastry, and I had to fill it make the dough in two sections and patch it. It was also so awkward to hold that I ended up filling it in with the egg mixture directly in the oven. This worked well, and amazingly there were no spills added to the already splotchy oven floor (I know I know, I have a self clean oven, but it still doesn’t always get cleaned when it should). The egg mixture is whatever you usually use for quiche, however one little trick I have been using is to add about 1 T of cornstarch for each cup of milk. This makes the egg filling a little firmer, but make sure you mix it very well before filling the tarts since corn starch sinks fast. The tarts were consumed on New Year’s morning, and were still delicious 2 days later as leftovers. I think you will like the Michel Roux book, I plan to try some other recipes in it soon. It is also just nice eye candy, and very informative in terms of the depth of why things are done in certain ways. My second Canele effort was using the new silicone mold I purchased in France. My understanding is that silicone molds vary in quality. The one I used was black, probably a medium quality, and for the large size caneles. I sprayed the molds with cooking spray, and they cooked for about an hour and a half. They came out easily, were browned, and after sitting developed a crusty exterior. The texture and taste were great. Although the copper molds cook faster and develop a better and thicker crust, the ease of the silicone will probably make me go to it first next time. Next step – trying a few more recipes, I think the shrinkage was a little too much, so I am going to try a recipe with a little higher proportion of flour next time to see if they shrink less. The recipe on La Tartine Gourmet looks good, and I am also going to try the one from my Bordeaux amie Martine’s mother. These are the Caneles made from the copper molds. For my first try I used the Martha Stewart recipe in her baking book. They came out very browned, and tasted great. I used spray grease on the molds, and used a toothpick to coax them from the molds. After sitting for the required hour, the outside was crusty, and the inside was suitably creamy. The flavour was delicious vanilla cream. Overall, a success. My only disappointment was that they shrunk so much that they were about the same height and width, and they are supposed to be taller than wide. I wanted to make Madeleines today, and to try again with a silicone mold. I used the recipe in Sherry Yard’s Pastry Book. They taste great, but I continue to not be very happy with the uneven browning from the silicone mold. This recipe has ground almonds in it, and the orange flower water adds a good taste dimension. They freeze very well, and are a great thing to have in your larder when unexpected or even expected company arrives for tea. After fillling the kitchen with the aroma of my latest 2 pain d’epices, I felt sorry for Greg and had to make him a gluten free version. The problem with many gluten free recipes is that they rely on rice flour, which in my opinion doesn’t have great taste or texture, and unfortunately Greg is also sensitive to rice, so I have learned to improvise. I have been trying to increase the protein and fiber content, and to improve the flavour in terms of picking flours. The recipe I have developed here uses several flours, but I’m sure you could just stick to gluten free mix that works for you and your allergy requirements. This came out wonderfully cakey and delicious, and I think anyone eating it would not necessarily know it was gluten free (that is the gold standard of gluten free baking in my mind). Chestnut flour can be found in some Italian grocery stores, I found it in little Italy at a small store nesr Bathurst and College. 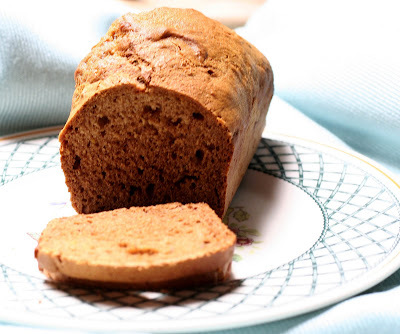 It has a slightly sweet nutty taste and works well in cake. Re xanthum and guar gum – I find guar gum makes a cake texture, and xanthum makes a more breadlike texture. I wanted cake texture, but also wanted it to be well bound, which xanthum does best. Use what you want, either will work here. Mix the dry ingredients. Mix the wet stuff (you can just melt the butter if you want). Combine and bake at 350 for….depends, about a 1/2 hour – depends on the size loaf pan you use. I now have a convection oven, so I baked it at 325 on convection and it came out light and fluffy. I started playing around with pain d’epices recipes after reading a recent post on David Lebovitz’s blog (see sidebar for link), one of my favourite food blogs for inspiration, and hey, he lives in Paris! After reading David’s recipe, I also checked my ever growing cookbook library, and decided to try the one in Nick Malgieri’s A Baker’s Tour first. I will call this the “lean” version – it has no fat or eggs, and fewer spices than other recipes. The sweetener is honey and sugar. It is very easy to make, you melt the sugar in water first, then just dump in the dry ingredients. It rose up beautifully, and made two delightful petite loaves in my little half size loaf pans. I cut it the next day after resting. It was a little chewy, but the flavour was very mellow and a little different from other gingerbreaddy stuff we are all used to. It rose up more than double in the petite loaf pans. After again resting (ok, not as long, I had to taste it before going to bed!) it is very good, sweetened only with honey, and would be good as a sweet, or also with cheese. My next try was the recipe from Flo Braker adapted by David Lebovitz and the recipe is on his blog. 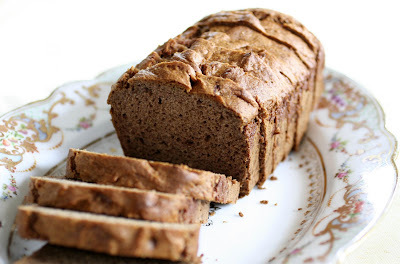 It has more spices, .It had more spices and is more like the flavour of typical gingerbread type of spicing. It also has a softer texture because it has a little butter and an egg. I made 1/2 the recipe, but just used a whole egg because if I try to use half it is impossible, it always manages to slither into the batter anyway! This version, maybe I can call it the “soft” type, turned out great, and was fairly tender. The smell of this was so good, I had to make a gluten free version, I will post the results.